Call it the Living Wonder or a Vertical City, Dubai’s Burj Khalifa holds a number of world records - tallest service elevator, highest occupied floor, tallest free-standing building and longest travel distance elevators. Designed by Adrian Smith, this skyscraper was inspired by Hymenocallis, the desert flower, popular for its long petals extending out from its centre. Take a look at some of the fascinating facts about this meticulously engineered marvel. Considered to be one of the most luxurious areas, many Indians have invested in the lavish apartments of Burj Khalifa. Bollywood actress Shilpa Shetty too owned a house here which she sold it last year. This month, you can watch this colossal structure turn pink. To raise awareness and funds for breast cancer, it will be illuminated pink on Thursday, Friday and Saturday nights. Visitors entering Burj Khalifa will dress up in pink to support this cause. For every item sold At The Top (Observation Deck), Al Jalila Foundation will donate Dh1. Burj Khalifa needs a supply of 250,000 gallons of water daily. Total electricity consumption of the building is equal to the electricity consumed by 360,000 bulbs of 100-watt each, burning simultaneously. Bollywood movie ‘Welcome Back’ starring Anil Kapoor and Nana Patekar (sequel to ‘Welcome’) was filmed in Burj Khalifa. It is two times taller than New York’s Empire State Building and three times as tall as the Eiffel Tower. At a time, 35,000 people can be accommodated in this tall building. It took approximately 22 million man-hours, 55,000 tons of steel rebar and 110,000 tons of concrete to build this extraordinary structure. Originally known as Burj Dubai, it was later renamed to Burj Khalifa after the UAE president, Khalifa Bin Zayed Al Nahyan. 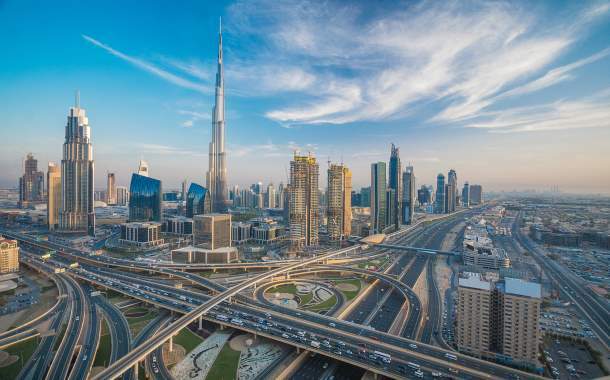 Check out the places you must visit on your Dubai trip. Get your Dubai visa for a fun-packed holiday.